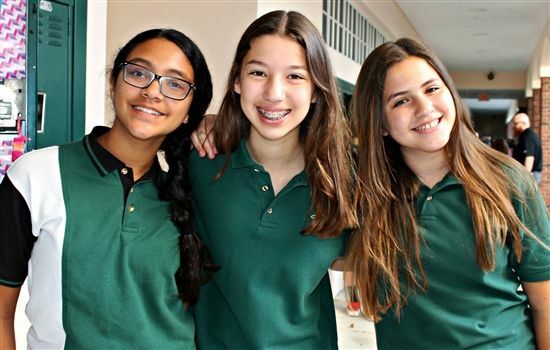 Middle School at Pine Crest is a time of much growth - physical, emotional, and intellectual - for our students. With Pine Crest's mission statement as our guide, our goal is to truly prepare our students to be global citizens who are prepared and inspired to make a positive difference. The classroom experience is student-centered with much emphasis on project-based learning and real-life problem solving. Middle School teachers encourage and lead students to think critically, to take thoughtful risks, and to innovate. Our Middle School counselors and teachers lead students through a structured Advisory program, giving students and teachers an opportunity to meet on a less formal level and explore character-building topics together on a small scale. Beginning in sixth grade, Pine Crest students have developmentally appropriate opportunities to increase their independence, with the use of personal lockers, deadlines associated with independent and group work, responsibility for an individualized schedule, and juggling after school activities with homework. Middle School students are challenged to hone their communication skills, articulating original thoughts in both verbal and written forms. Students learn critical thinking and close reading through various forms of literature and compositions via annotation, discussion, collaborative and independent projects, and unique experiences. Students participate in discussion forums where they engage in meaningful literary debate, literature circles, Harkness discussions, online discussion boards, both small group and paired discussions, and whole group discussions. Students are exposed to creative expression through writing opportunities and genres of composition — from low-stakes to high-stakes and from creative to formal. Traditional grammar instruction is highly enforced throughout each grade-level by teaching students to parse and diagram and to understand how stylistic choices affect writing. All Middle School students use the computational thinking process as they customize, program, and debug projects. Special attention is given to the importance of writing maintainable code that includes meaningful name conventions and comments through Python, Linux, Java, Arduino, Make Code, and various other programming languages. Students use block-based programming and begin a transition to text based Micropython. Using a combination of LEGO EV3 robots and Micro:bit microcontrollers, students focus on developing and testing abstractions that lead to coding solutions to real-world challenges. Students are introduced to the text-based programming language Python and a variety of computing platforms including Raspberry Pi to learn about real-world inputs and outputs and how to design simple graphical user interfaces. Projects focus on sending and receiving data over networks to other devices as part of the Internet of Things (IOT). Python data structures focused on lists, tuples, and strings are used to allow for more efficient coding. Students transition from basic mathematical computation to more advanced algebraic reasoning in Middle School. Students become independent problem solvers with critical thinking skills through the authentic application of abstract concepts. Students develop critical thinking skills through labs and hands-on application of science concepts to real-world scenarios and problems. Students experience science through recording and interpreting data in lab notebooks and using hand-graphing techniques and computer software. Math skills are also reinforced through the application of problem-solving, and writing skills are cultivated through lab reports. Middle School students focus on life science in grade six, earth and space science in grade seven, and physics in grade eight. Student learning is driven by presentations and discussions that introduce and develop content knowledge; interactive notebooks which organize student learning; and experiential-based activities that enrich student learning. Connecting the past to the world today is accomplished by an intentional, comprehensive study of global civilizations. For instance, by studying Greek and Roman government, students understand the foundation of the American government. Through social science, Middle School students develop an appreciation of other cultures and how they influence the world today. There are three languages available for study in Middle School: Chinese, French, and Spanish. Authentic materials and real-world situations are integrated into the course as a means to foster students' motivation, interest, and participation in realistic cultural and linguistic scenarios. Students study dance as both a physical and academic endeavor. In daily technique classes in ballet, students are grouped according to their physical ability and dance experience. Academically, students are assessed on criteria including, vocabulary, choreography, and dance theory. Pine Crest News Network (PCNN) serves as the first time many students participate in a hands-on, immersive experience in field production. Students learn skills that are crucial to telling stories, digital media production, research, and script writing and visualization. Students learn about media literacy as they discuss how camera and storytelling techniques influence viewers. Students have a variety of options to pursue their interest in music. Options include band, chorus, jazz ensemble, orchestra, and private lessons. The goal of these music offerings is to complement the challenging academic experience by providing an equally high standard of excellence in the arts that fosters the development of character, independence, leadership, and collaboration. Students practice the basics of movement and vocal production, improvisation, theater terminology, presentation skills, and study dramatic structure, literature, and great plays. Advanced drama students may also participate in the Middle School Junior Thespian Troupe. These students compete at the district and state level, performing monologues, scenes, and musical solos. The visual arts program aims to foster an appreciation of art through hands-on experiences with a variety of materials, techniques, and approaches to visual communication. Students practice the application of the elements of art and principles of design. Elective classes include drawing, painting, and printing as well as three-dimensional work in clay and other materials. Students practice individual and collaborative activities that further develop their fine and gross motor development, appropriate social behaviors, and leadership skills. Students may choose between three tracks, performance training, team sports, and personal fitness. Performance training focuses on movement based on real-world situational biomechanics. They usually involve multi-planar, multi-joint movements, which place demand on the body’s core musculature and innervation, also known as functional movement. Team sports features a wide-range of activities, including basketball, flag football, team handball, ultimate Frisbee, soccer, Spikeball, and others. Students improve individually through drill work and learn how to best contribute to the success of a team. Personal fitness focuses on developing upper and lower body strength, and core strength using bodyweight exercises and other functional movement apparatus. Pine Crest Middle School hosted the VEX Robotics Tournament recently. Pine Crest School eighth grade students on the Boca Raton campus celebrated their investiture on Friday, August 24.